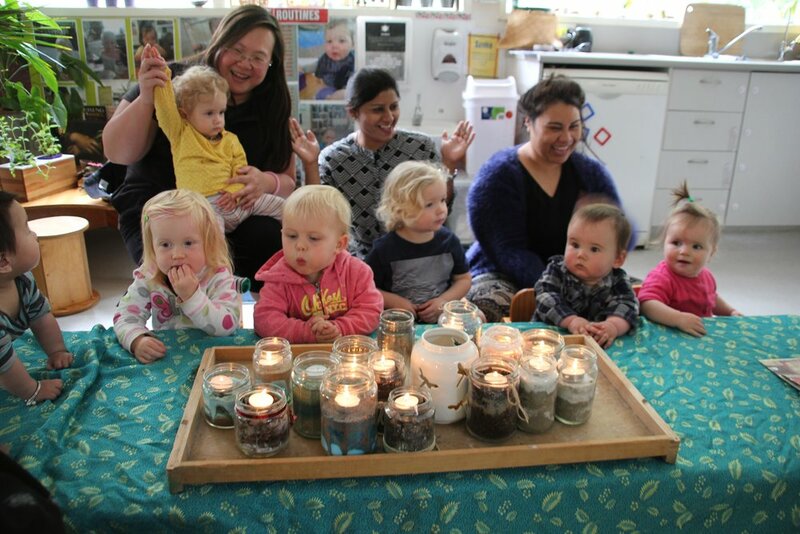 Tui iti (Little Tui) is our Whare for infants from 3 months of age. Our focus is building a strong relationship between the child and their primary caregiver to ensure their emotional wellbeing is prioritised. The primary caregiver works to build a secure attachment through playful, caring and gentle interaction during the care routines (feeds, sleeps and nappy changes). We like to think of it as your child’s dependable best friend who’s always there for reassurance and support. Each child’s primary caregiver works closely with the parents to ensure a supportive settling process and that the child’s care routines from home are followed. We value this partnership to ensure that that needs of the child and family are prioritised. We want family to feel very welcome to join us for family events, but to also visit anytime. Our play based curriculum is designed to meet the needs and special characteristics of toddlers. We focus on providing a calm, respectful and nurturing environment for toddlers to explore their developing self-discovery and independence – with much joy and laughter peppered over the day. You and your child will have a settling Teacher to support you as you gain familiarity with our environment, your child’s peers and other Teachers in the group. We enjoy close relationships with families and open sharing of information in our partnership with you. We value and model respectful and positive guidance in response to the ups and downs of typical toddler behaviours that can be present one moment and gone in the next. We recognise toddlers require flexibility to grow and regress as their sense of self evolves and support this by allowing them to be both big and little as they gain confidence in themselves and discover their independence. Our holistic programme promotes continuity of learning from our service to schools. The curriculum integrates children’s language and culture to foster a strong sense of identity. Innovative teaching links unfamiliar learning to something familiar and includes children’s voice. Confident learners are supported by responses to interests, strengths, capabilities and dispositions such as; persistence with difficulty, being curious, taking responsibility, developing trust, playing fair, asking for help, sharing knowledge, risk taking, confidence, problem solving, openness and thinking skills. literacy, mathematical and scientific concepts and skills in meaningful and authentic contexts alongside guided group times and tasks. their Working Theories, Learning Dispositions and Mana.